Wise’s debut novel, and Florida State University doctoral dissertation, is set for release in June. Spencer Wise spurned shoe business. His great-grandfather left Vilnius, in Lithuania, in 1907, sailed to the United States as a passenger aboard the SS Carmania, was processed at Ellis Island, settled in Boston, and sold leather from a horse cart. His father, as a boy, swept the floors in a shoe factory owned by his grandfather in Amesbury, Massachusetts, became an apprentice and went on from there, a “shoe-dog” forever on the run, landing in far-flung places where it was possible to make shoes cheaply: Taiwan, Italy, Yugoslavia, Brazil and, for the last 30 years, China. But Professor Wise, who teaches creative writing at Florida State University, has opted for a career in letters rather than leather. “My dad has supported my decision, and that has been moving and beautiful and has really helped me keep going as a writer,” said Wise, whose older sister and an older cousin also declined to try on shoes. 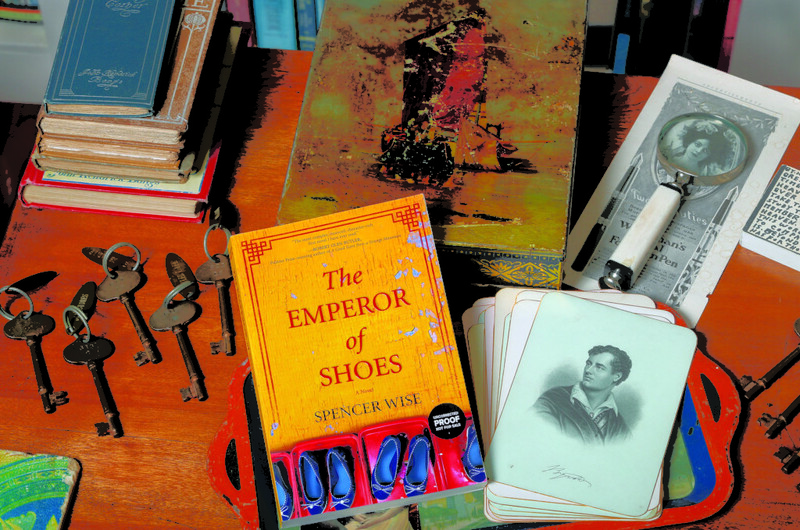 Wise, however, is so near shoemaking that he was motivated to write about it as the subject of his first novel, The Emperor of Shoes, scheduled for release (Hanover Square Press) on June 5. He traveled to China in 2015 and spent a year, mostly in the factory town of Foshan, doing research for the book, which would become his doctoral dissertation at FSU. Alex Cohen is the protagonist in the more than loosely autobiographical work that is a rite-of-passage novel, yes, but has also been likened by its marketers to Upton Sinclair’s The Jungle, a novel which exposed deplorable working conditions in the meat-packing industry in early 20th-century Chicago. Cohen reluctantly becomes a partner in his father’s shoemaking enterprise, and increasingly discovers that it is rife with corruption, bribery and the exploitation of workers. Cohen is crimped further by the strong arm of a party boss at whose pleasure his father operates his factory.That conflict intensifies as Cohen’s affections for Ivy, a seamstress, grow, and Ivy tries to draft Cohen into the underground Democratic Revolutionary Party for whom she is working as an organizer. Or do you? Is it possible to simultaneously satisfy the interests of government, a company and its workers? Wise believes his publisher bought his novel in large part due to the parallels between the Chinese workers it depicts and itinerant workers in the United States.“Given the Trump presidency, the timing for my book was perfect,” Wise surmises. “Ostensibly, you have Donald Trump running the country, but you also have migrant workers running the country. Kick all the recent ethnic immigrants out of the United States and see what happens. America would come to a halt. The world, Ivy advocates, must be caused to see the unseen. “He’s part of American life that we choose not to look at,” Wise said about his father. “We are disconnected from the sources of the products we use and the foods we consume. How disconnected can you become before that distance starts to separate you from who you are? We don’t make anything or understand where it comes from. The chair in the living room, the chicken in the freezer, the clothes and shoes we wear. It all just comes.” Emperor succeeds in embodying the invisible. Wise has confronted his father with difficult questions: For especially a Jewish man to participate in an industry that exploits people, is that not grievously hypocritical? Do you feel complicity, culpability in that? What is the rationale that permits you to live with what you do? Those questions, Wise said, always have gone unanswered. “My dad read my manuscript and liked it,” Wise said. “It does honor our culture to an extent, but, in many ways, it is a cultural critique. Maybe, out of pride, he missed that. Too, as Wise points out, his father is thoroughly a businessman who’s “probably read 10 books in his life.” He’s a shoe guy. Wise is indebted to his father — shoe money put him through Tufts University in Boston — and to a host of people who helped him with his book, including most especially the head of his dissertation committee, the Pulitzer Prize-winning novelist Robert Olen Butler. Everybody needs a cut man, an interviewer tells Wise. You can pre-order Spencer’s book on Amazon.